If you're co-op gaming consists solely on the couch and your internet connection is provided by carrier pigeon, we've got something today just for you. The first two add-on campaigns and other Borderlands 2 DLC are being packaged up and made available at your favorite retailer for $29.99. 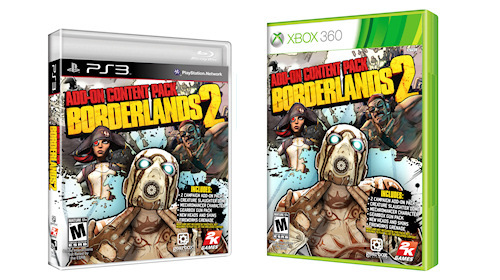 It's called the Borderlands 2 Add-On Content Pack and will be available on February 26th. That special price point saves you $10, it would cost $40 if you bought the content packs that are bundled with it individually. Some of the content was actually pre-order bonuses while others were released for a limited time for free. Story wise you'll get Captain Scarlett and Her Pirate’s Booty and Mr. Torgue’s Campaign of Carnage. Receive a Golden Key to unlock rare loot from the golden chest in Sanctuary. Missing is Sir Hammerlock's Big Game Hunt. There's also a yet to be announced fourth story based DLC coming soon with the rumored level cap increase. There also doesn't seem to be a PC version of this content, the retail disc will be Xbox 360 and PlayStation 3 only. Borderlands 2 features four player online co-op, two player couch co-op, and combo co-op support on Xbox 360 and PlayStation 3. The PC version features four player online co-op.